1. Log into your Plesk panel. 2. When you click on Websites & Domains tab, following page appears. 3. Click on the WordPress icon on the upper right hand side of the page (as shown in the following screenshot). You can also click WordPress icon in the Featured Applications menu (lower right hand side of the page). 4. 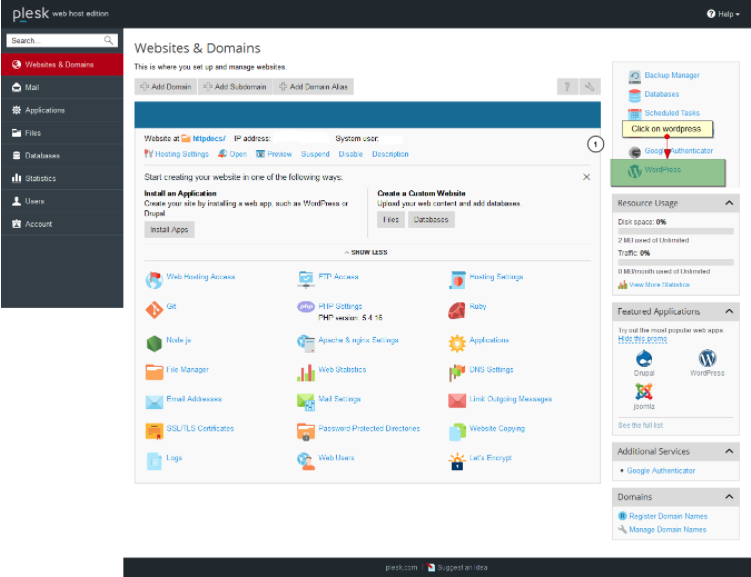 Click on the Install button to install WordPress in your Plesk panel. 5. View the progress of installation. 6. Once your WordPress installation completes, MY CMS page appears, wherein you will receive your WordPress access details or your WP log in credentials.